2016 was another busy year for the team with 117 ‘999’ calls received of which 73 led to some response on the fell. This review considers the 2016 statistics, both for the year as a whole and in the wider context of the past 13 years. In total 1353 incidents are included in the analysis. The presentation of data and definitions used is the same as that used in previous reviews published on the team website. These are repeated at the end of this article. The graph above shows that since 2007 the team have regularly been dealing with over 100 incidents a year, with a peak at 133 in 2009. 2016 was the 4th busiest on record and had a relatively large number of limited callouts, reasons for which are discussed later. The PIE chart below shows a breakdown of the 2016 incidents by type. 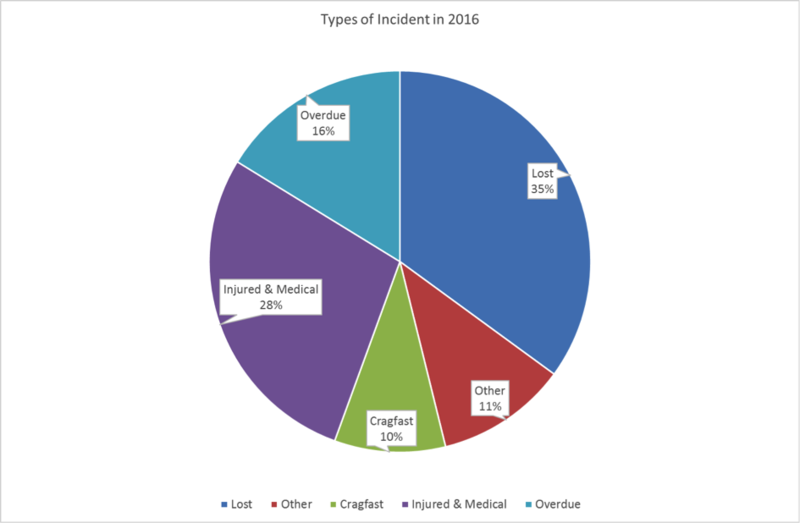 The most common reason for a ‘999 call’ to the team in 2016 was being lost, representing 35 % of calls, up from 32 % last year, followed by injured / medical at 28 %. 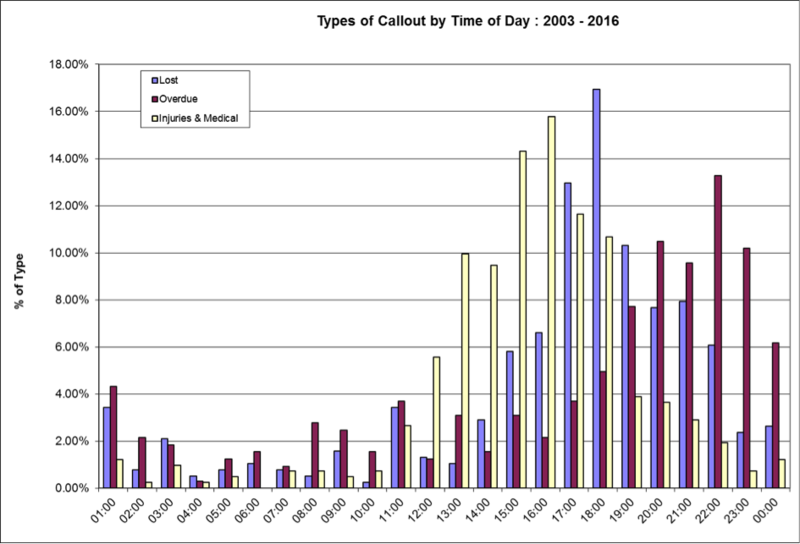 Over 13 years the proportion of injuries and medical issues is relatively constant around 30 %. 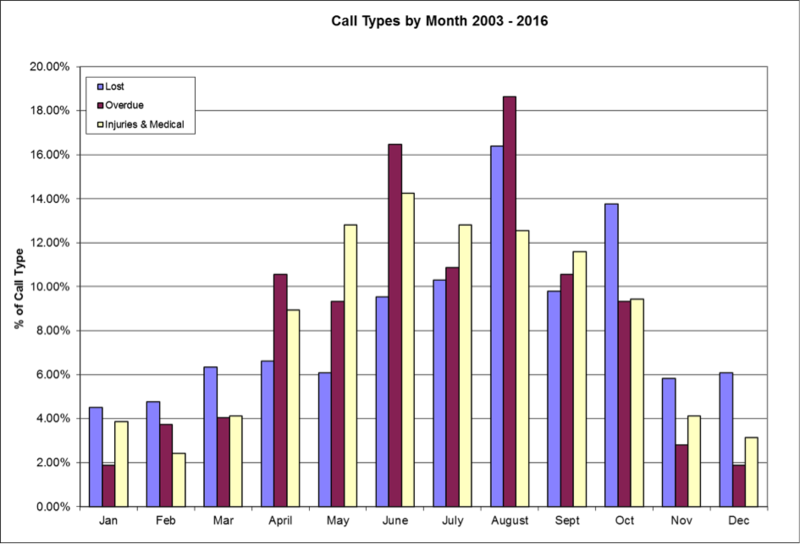 What is also shown is that the long term trend in losts has increased. Whether 2016 is a blip or an acceleration remains to be seen. The number of overdues has clearly decreased. 2016 also had the most Cragfasts in a year with 11. 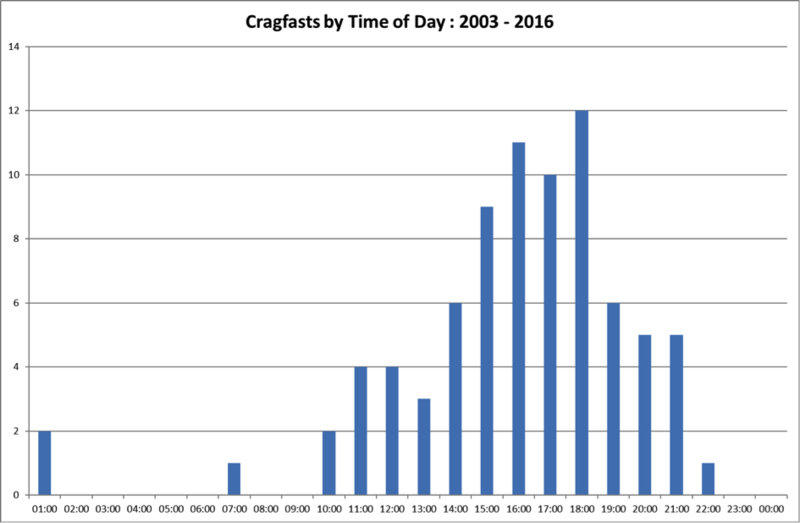 Whether there is an increasing trend in Cragfasts is hard to clearly determine from the data. 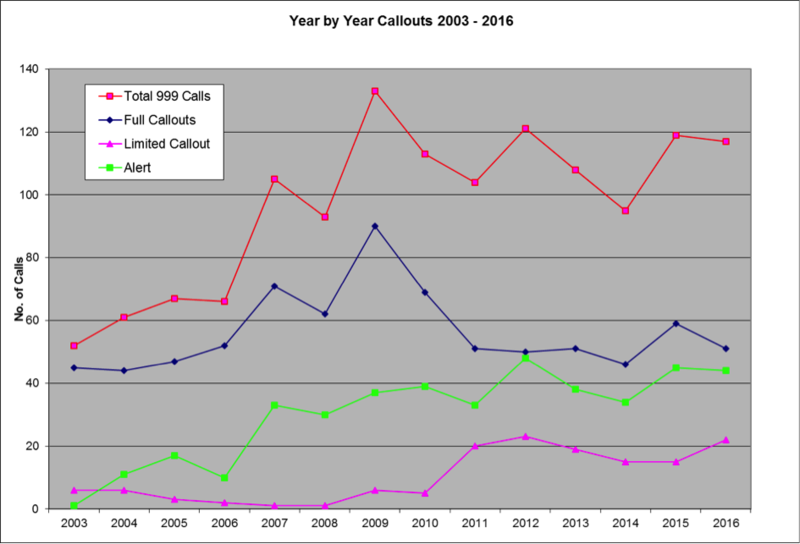 The plots below show the breakdown of calls by month of the year for 2016 and for the past 13 years as a whole. 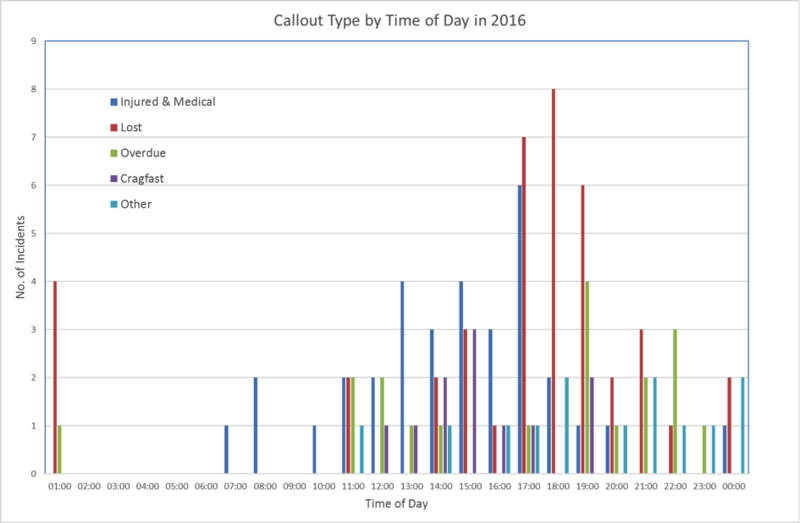 The breakdown of calls by time of day is shown below, both for 2016 and the past 13 years as a whole. The x-axis is the highest value of each data ‘bin’, ie : 13:00 is all times from 12:01 – 13:00 and so on. In 2016 August was clearly the busy month with around 20 % of all activity for the year. Those who were involved certainly remember being called out almost every day, sometimes more than once. May and September were surprisingly quiet compared with the long term trend. After 13 years of collecting and analysing the data it is apparent the team is quiet from the end of October half term through to Easter, with peaks in June (3 peaks) and August (summer holidays). 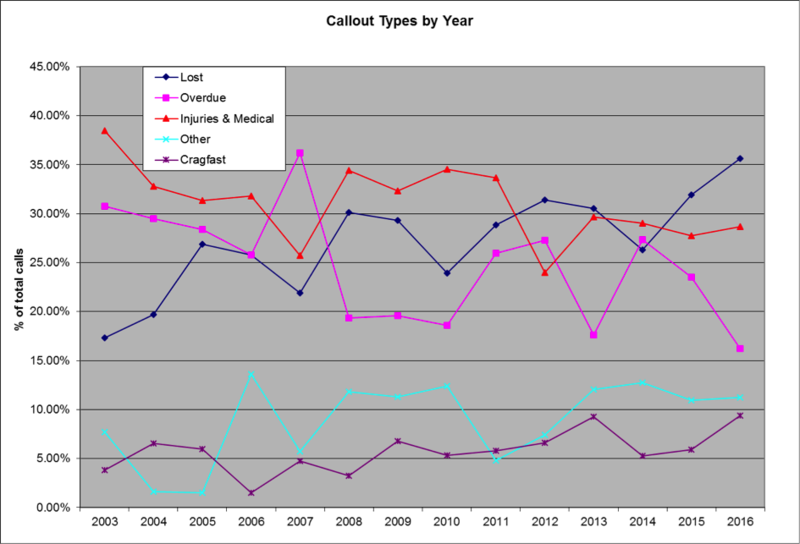 It is notable that it is Overdues and Losts which drive these increases, the proportion of injuries is relatively flat across the summer period. In contrast to this, injuries proved to be the most common type of call in August 2016. Over the years a consistent picture has emerged in terms of when particular types of incident occur. Most injuries / medical problems occur between 14:00 – 18:00 and 72 % of these incidents have occurred between 12:00 – 18:00. The Losts generally phone in between 15:00 – 21:00 (62 %), whilst Overdues tend to be reported later, between 18:00 – 00:00 (58 %). As noted earlier 2016 had the most Cragfasts in a year with 11. 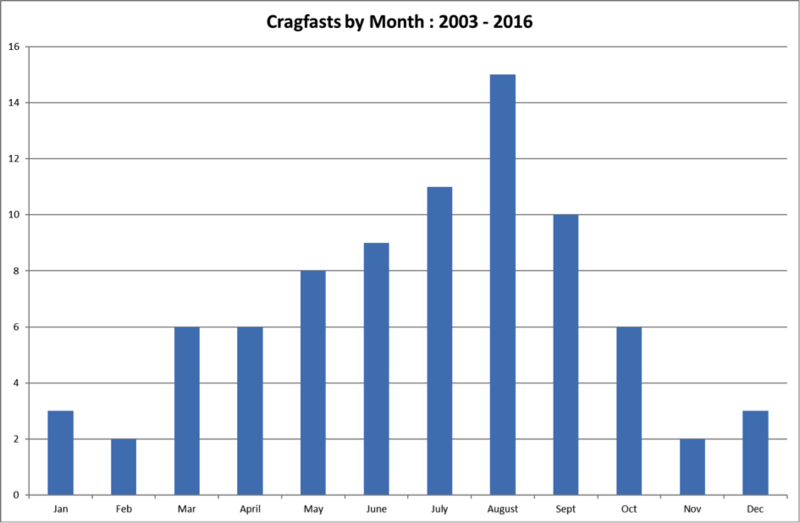 The figure over the page shows the breakdown of Cragfast incidents by Month over the past 13 years and it clearly peaks in August. Also shown is the time of day these incidents are reported, 50 % of these types of incidents occur between 14:00 – 18:00 as people are making their way off the hill. The main issue in 2016 was the increase in the number of people reporting themselves lost whilst on the mountain by mobile phone. It can be seen this is partly an issue during the summer holidays but there is also an increase in October, usually when people are caught out by the shorter days without a torch. By recent standards there were comparatively few 3 peaks related incidents in 2016. There is some reason to believe more parties are going with mountain leaders and other organised groups which may be having a beneficial effect reducing the number of Losts and Overdues. The team has adapted somewhat to the trend for more people reporting lost as can be seen by the increase in alerts, where someone is talked off by phone and this year’s increase in limited callouts where a small team goes out to walk a party off from a known location. 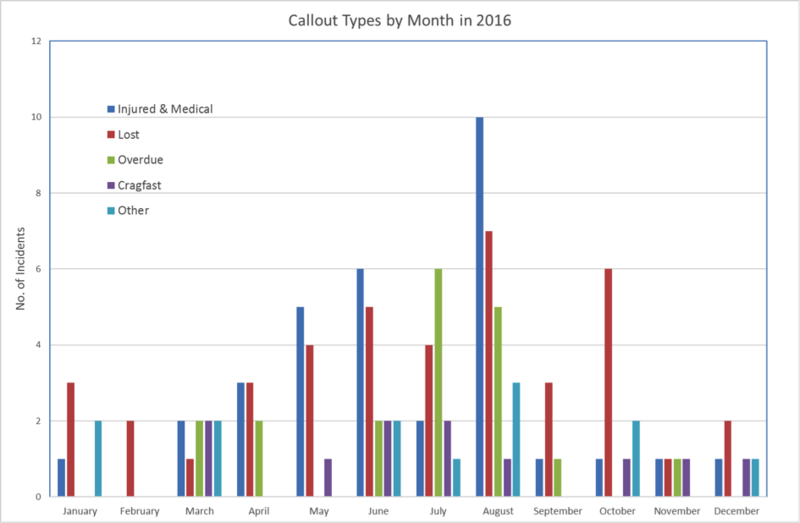 In this sense the increase is not occupying the whole team and it can be seen that the number of full team callouts has remained fairly constant over the past 6 years at just over 50 / year. However, it has to be said that the biggest reductions in the team’s workload would be achieved by more people taking a torch with them in October and a general improvement in navigation ability and preparation amongst hill goers, particularly on Scafell Pike. The team are paged by the calling authority. The team leader and potentially others make enquiries by phone, car parks/pubs may be checked, but there is no response on the fell. The main reason for the call is an injury or medical problem. Someone on the fell reports them / party, usually by mobile phone to be lost and in need of assistance getting off the fell. It is different from cragfast in that it is navigation which is the challenge. Person / party is stuck and cannot make further progress due to the difficulty of the ground, eg : it is steep and craggy. In this case they may know where they are but cannot move. 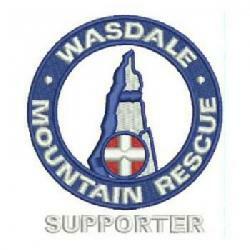 It also includes people stuck on the Wasdale Screes. Includes non-mountain incidents such as cars stuck on Hardknott Pass, flooding, urban searches etc. Also includes false alarms with good intent.